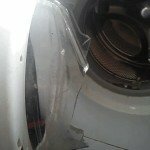 I’ve been writing about and following cases of “exploding” door glass on washing machines since 2008. There’s been a steady trickle of reports from people with various brands. Some even claim their door glass shattered spontaneously when the washing machine was not even switched on. It’s not easy to judge how much of a genuine danger this. It’s potentially a genuine safety concern. Customers who report these incidents are definitely claiming it is dangerous. I have seen reports of people being cut and injured, but nothing serious so far. As far as I can make out it’s been more to do with being cut picking up the glass. Back in 2012 there was a brief flurry of international media interest in my article. It was widely quoted and linked to. However, presumably without any reports of serious injury it was soon forgotten. This article is about the door glass exploding. Another issue, which has also had national press coverage is when the washing machine itself explodes from the drum out which is much more violent. This is a known issue related to specific brands and is covered in my article here – washing machines exploding: What’s going on? I’m not entirely happy using the word explode because it sounds sensational. But as most people experiencing this issue use that word it needs to be used. Some have even described it as being like “a bomb”. This picture is of a Beko washing machine> Beko are one of the most common UK washing machines who so far have the highest reported cases. The consumer who sent it me wrote, “I dread to think the outcome if my son had been in front of the machine at the time!”. Concerns over children (and pets) have often been mentioned. Seeing this picture on my Facebook news-feed heightened my concerns. 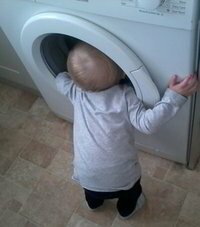 It’s of a friend’s small child innocently looking into their washing machine. No parent could be expected to foresee the thick door glass of their washing machine shattering, either when on – or especially when it’s just standing unused. This photo is worrying when you know about all of the incidents that have happened (rare or not). Clearly it’s best to not let children get this close up just in case. Manufacturers are saying the problem is caused by foreign obstructions such as coins or metal buckles hitting and weakening the door glass. The weakened door can then shatter under constant heating up and cooling down. Another theory is that it’s caused by people overloading the washing machine. However, it would be nice if the door glass was strong enough to cope with such inevitable stresses. I have written an article specifically covering that subject here – exploding door glass who’s fault is it? Which washing machines are affected? Many brands have been mentioned across the price range. Cheap, middle, and even some top-end brands have been affected. So it’s not necessarily only the cheapest brands. See the tally of reports on the right column (after the comments on mobile devices). Until a definite cause is proved it’s difficult to know what needs to be done. The main expectation is that the door glass maybe needs to be made thicker. There’s no proof that the glass is too thin as yet. If manufacturers placed a plastic cover in front of the door glass it would definitely prevent any injuries. This would make it double-glazed. It’s likely to be difficult to fit one retrospectively. So it would probably need to be designed like this from the off. This was actually done around 20 years back by Hoover on models like the Eco Logic, Soft Wave and New Wave. However it was done for thermal protection and insulation. To my knowledge, and in my experience, the shattering door glass was not an issue back then. I didn’t come across any shattered door glass until around 2008. What can you do to limit any danger? Enough reports of the glass shattering whilst the washer isn’t even on have been made to be taken seriously although this still appears to be rare. Don’t let kids play around washing machines until this issue is hopefully resolved. Some door glass appears to break into relatively safe rounded chunks, but some (see photos of broken glass ) have broken into more sharp and jagged pieces, which definitely look dangerous. Remember, there are only (presumably) a few hundred cases out of millions of washing machines and only a small percentage of them claim the washer wasn’t running at the time. So the odds of it happening at all – never mind someone being in front of it at the time – should be very low. If you are concerned enough to need to do something you could try hanging a thick towel over the door when the washer is not in use. That would prevent or limit any glass flying out. Keep children and pets away from it especially when it’s running. Many of them aren’t built as well as they used to and can’t take much “abuse”. Don’t overload the machine by cramming it so full that the whole laundry just turns around in one big lump. Don’t under-load it either – Loading a washing machine). Also make sure you check all pockets for coins and other obstructions before washing. Don’t put laundry in with metal buckles or buttons which could hit the door glass. I’ve seen two new AEG washing machines that both have a protective plastic see-through plate in front of the door glass (which is the solution I’ve always described). However, they were both washer dryers. So it’s more to do with thermal insulation again than protecting against shattering door glass. As AEG have only had 1 reported incident on Whitegoodshelp (so far) it seems unlikely they would have introduced this “shield” for safety. It’s likely to just be coincidental. If your washing machine door glass has shattered or exploded please send (in focus) photos so I can consider putting them on this article as examples. Contact me using my contact form and you can then attach the photos to my email reply. Exploding door glass who’s fault is it? For an article on actual washing machines exploding (not just the door glass) go here – Washing machines exploding: What’s going on? Thanks for publishing that warning and showing the photos. It is truly shocking. Would something like the British Standards Institute be worth contacting for advice? They used to have a testing centre in Milton Keynes where they carried out rigorous tests on consumer goods. Might still be there. Like yourself, I am shocked by shoddiness of modern washing machines as compared to their older counterparts. My 14 year old washing machine was capable of doing a high temperature wash without the glass door becoming a lethal weapon. The 1st time I did a similar wash on my new (July 2008) machine, the glass got red hot – enough to cause a burn. Not that I routinely finger glass doors, of course! However, It would be too dangerous to use if there was a small child in the house. I did question this with both the retailer and the manufacturer but was told that my machine was no different than others. Please tell me that that is not true! How do these things ever get passed for sale? I myself am extremely dissapointed with how washing machine’s are made. At this moment I am waiting on an engineer comeing to my house to do a report on my washing machine . On Sunday night the glass exploded from the door shattering all over the floor and worktops when it was on the final spin,3mins to go. The machine is only 4 months old and luckily nobody was hurt. It was bedding and towels I had in the machine at the time. I have recently had the experience of the glass door in my Beko washing machine exploding / shattering on a 90 degrees hot wash and the machine is less than 4 years old. Beko were not very helpful and the issue has been raised with Hertfordshire and Cambridgeshire Trading Standards. The machine has since now today been repaired but should I trust it with high termperatures again? They only seemed to be willing to come back and finish the repair after contacting Trading Standards. Hello Alex: If they didn’t explain exactly what caused the glass to shatter and what they’ve done to prevent it happening again (for example has the new door glass has been modified to prevent it happening again?) then presumably it could happen again. If that’s the case you might be able to claim the washing machine isn’t fit for its purpose because it isn’t safe to use though unfortunately we don’t know what caused it at this stage. Therefore you would need to be able to prove that this is a design fault and that might not be easy (see my exploding door glass – who’s fault is it? article). If you have lost confidence in it you may be able to claim compensation from the retailer under the Sale of Goods Act which gives consumers up to 6 years (5 in Scotland) to claim compensation. Under the Sale of Goods Act it’s only the retailer who is responsible despite the fact that they didn’t actually make it. If you pursue this line you can expect resistance from virtually all retailers who generally tend to just claim there’s nothing they can do once it is out of guarantee, which is not true. If you do win compensation in the small claims court they will likely knock off about half the value of the washing machine because you’ve already had 4 years use from it. We had just bought a Samsung washing machine never again we were doin laundry as normal towels ect, when we heard a bang went to investigate and the the glass inside the machine broke right in half and glass everywere.We have been waiting for 2 weeks for a Samsung tec to look at it.Be carefull with theses machines the glass could have really hurt someone if they were standing there.Theses washers are dangerous and can cause serious damage to someone. I am currently waiting for an engineer to come and fix the glass in my Zanussi washer dryer. I was doing a 40 wash not overly full and when I went to open the door I cut my hands on some glass. I have never heard of this until it happened to me and I looked on the web abd saw your comments. I am really disappointed with how they are made, especially knowing that my mum has had many washing machines over the years and she has never come across this happening. I have had a BEKO WASHING MACHINE, for 10 days. Last evening around 4pm, we were sitting in the living room, when we heard this loud bang, we found the cause, the DOOR ON THE WASHING MACHINE HAD JUST EXPLODED, the machine was not in use at the time. There was no know reason for this, as the machine, was quite empty, and still, with not a soul any were near it. On phoning BEKO, we were told, WE WOULD GET A PHONE CALL WITHIN THE NEXT 48 HOURS FROM A ENGINEER, mind you I know really don’t trust any machine, as he will be only fitting a new door. BEKO has informed us they will be here some time on the 1st. SEPT.
To fit a new door, I must say, they didn’t sound a bit surprised, so I will let you know just what takes place. With reference to the above comments, I am so glad that the exploding washer/dryer glass door has not only happened to me. I am currently pursuing the dangerousness of this matter as two weeks ago, with 3 items in the machine on a dry cycle, a loud bang occurred, similar to a pipe bomb going off. Following investigation, the glass of the door and its surround had been blown out at such a force, it had dented my fridge freezer door and also a sweeping brush handle which was approx 5 feet away from the machine. The 3 items inside the drum had also caught on fire. I perish the thought that if any one had been in front of the machine when it exploded, they would have either been severely maimed, or, if it was my youngest child who is only seven, he would not have stood a chance and could have been killed. So far, a senior engineer has been out from the company who made this deadly machine to supposedly do a full diagnostic check, yet, all he did was a fire check and alienate me and my husband because of his rudeness and obstructiveness. He made us feel that it was our fault that this product had blown up and was not interested in how it has affected us. I even asked him whether he had any suspicions as to why it had happened and his reply was that he did not wish to speculate.Some senior engineer hey! Yesterday, we were offered a replacement washer/dryer because they want the killer machine back for further testing yet, I am more annoyed that there has not been a mention of the word ‘SORRY’, for the stress this has caused and the numerous phone calls I have had to make to both parties who were involved with making and selling me this deadly machine. My advice to all consumers is that if they encounter safety issues with any items they may purchase, at first contact Consumer Direct about their worries and if they think that there is a safety issue they will pass the information on to the local Trading Standards Authority like they did in this particular case. Also, make sure you report the incident by writing to head office and send it by recorded delivery so that you can prove that it got there. Don’t forget to make a duplicate of the letter too so you can always refer back to it. At present, I do not know whether I will have an explanation as to why the door exploded and by giving me a replacement in turn for the collection of the machine is a way of shutting me up and keeping me sweet. However, I am still very upset about the whole thing and now I have seen, by reading these comments that other people have gone through similar experiences has made me more determined to get to the bottom of it. If anyone has any suggestions or advice about this topic, please leave your comments as I feel, that at the moment, I will not be at ease until I have been given a reasonable explanation as to why this happened! Hello Julia. You don’t mention the make of this appliance or the model number. It sounds like the engineer may have been defensive, which is understandable. I’m not trying to excuse the attitude, just possibly explain it. I would assume that when any manufacturer comes across a safety issue like this they are pretty scared of potential consequences and may be quite reluctant to apologise, which could be seen as an admission of responsibility – especially if they genuinely don’t know how it happened yet. Of course they should definitely be held accountable for safety failings if it’s shown to be the case. I think it’s quite likely most people will get the same cold, clinical and cagey response, (which is not what they want) because of their over defensiveness and fear of admitting responsibility. The irony is that many people would be satisfied with a genuine apology, and are much more likely to become litigious because of the lack of any apology or even sympathy. The problem is that manufacturers appear to be saying the issue is always caused by user “misuse” so are not likely to accept any responsibility unless it can be proven that it is a manufacturing flaw or failing. Thanks for your contribution, and please keep us informed of unfolding events. If the new door glass is thicker it might imply they are aware the original glass was too thin and have tried to improve them. I just googled washing machines and exploding doors and came up with this website. I have been a Miele customer for years. I run two Miele one is 13 years old and it is used for animal bedding and smelly farm clothes and has never given any problems, when the old Zanussi packed up a year ago which the previous owner had left and was used for the above dirty jobs, I bought a new Miele for the personal clothes, t owels etc for my husband to come down stairs this morning and find that the glass door of the new one had exploded and put water and glass everywhere. 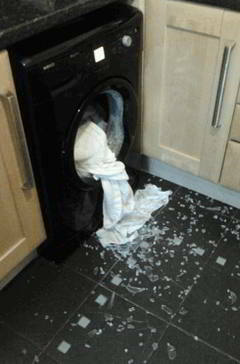 Regarding the door glass exploding on a Miele washing machine someone else emailed me about it happening to them the other week (unless by any chance that was you). As I replied back to them this is definitely not what you would expect from a Miele washing machine. My Miele W3740 washing machine glass door suddenly exploded shedding shattered glass and water around the room. The machine cost £700 and is only twenty months old so still within guarantee. It was about twenty minutes into the 95 degree cycle and was only at the beginning of this two hour cycle. On examination door looks as if it has been crushed into thousands of pieces, some hardly visible to the naked eye. The glass is still attached to the metal door around the lock area but has completely disintegrated around the rest, especially on the hinge side. According to the specification the door is caste metal although the engineer said it was not? He also said the glass door is the only part of the machine that Miele do not manufacture themselves. Overall he had little to say but did mutter he thought it was a problem with the door! I was fortunate that no one was near the machine or they would certainly have been scalded or cut from the flying glass. I was also fortunate to be able to get to the machine before serious flooding occurred. I don’t think I would ever leave a washing machine unattended in the future. I have written to Miele and Comet by recorded delivery under the Sale of Goods Act 1979 but so far there has only been a deafening silence. Miele’s engineer said their management support would be in contact, I have heard nothing. I am concerned that there are other potential time bombs out there, surely both retailer and manufacturer have a duty of care towards their customers. Miele’s own engineer has examined the machine and reported back his findings, if Miele want to retain their good name they should take immediate action to find the cause for this failure and ensure it cannot happen again. The Miele W3740 is still available for sale. These reports make alarming reading, especially that a Miele washing machine glass door exploded – from one of the “best” manufacturers of washing machines! I’m starting to wonder if there is only one manufacturer of the door glass itself? Probably some cheap Chinese manufacturer, with the low-strength glass being imported by all the washing machine manufacturers? Anything to cut costs! This should NEVER happen and I hope someone will know which government safety department(s) should be contacted about this problem, along with the EU people, who could stop this happening in the EU member states. As for the glass becoming too hot to touch on 90C or 95C washes – all washing machines should really have an outer glass or plastic cover to prevent young children from touching the hot inner glass. I’m glad I’m always at home when I have the washing machine on – you can’t trust a washing machine to be left totally unattended!! As regular readers will know from other blogs on this site, I have to add a little more hot water to the main wash and lots of hot water to the rinses, as my skin is too sensitive and modern washing machines don’t rinse properly, another sign of the poor quality of modern washing machines. In fact, modern washing machines are very poor quality as they are too cheap – the door glass breaking so easily is more proof they are cheap and nasty – literally! Washerhelp, who should people contact if the door glass breaks? With today’s over-zealous “health and safety” laws, this problem must be rectified immediately. It never happened with older washing machines, so why is it happening now? Hello WMUser: The responsibility in consumer law is with the retailer, so if someone wanted to reject the washing machine and say they cannot trust it any more they would need to argue that case with whoever they bought it from and not the manufacturer. Having said that, any manufacturer is likely to be concerned about something like this happening and may well try to accommodate a consumer in some way. The dilemma they face is that if they simply replace the part in question what assurance is there that the same thing won’t happen again, yet if they say they’ve improved the design they concede that the original one was in some way deficient. Regarding more wider safety concerns, people like Trading Standards, watchdog and other consumer groups would potentially be interested if this was seen as a consumer safety issue, which it certainly looks like. Whilst on the topic of safety issues there are increasingly concerning related issues I need to write more about such as exploding fridges and exploding washing machines where serious explosions are taking place putting consumers at great risk. One can only assume these issues are likely to be caused by the ever increasing drive to keep production costs and retail prices down resulting in reduced quality and corners being cut. It was my Miele W3740 that had the glass door suddenly shatter, unfortunately having written a letter to Comet under the Sale of Goods Act 1979 and copied in Miele, both sent via Recorded Delivery, I have had a very disappointing response from both parties. Miele have agreed to clear the glass from the drum under the guarantee but as they want to undertake major engineering on my premises and use heavy lifting gear to access the drum I have declined. Under the Sale of Goods Act I am not obliged to accept a repair. In any case they are aware that I have lost confidence in that machine. Comet as retailer has the liability but they have made minimal effort. Neither Comet nor Miele have given me the the courtesy of a reply to my letter, I doubt that any of the staff are able to put one together. I have had one phone call from Comet when I informed them that legal action is to follow, that was a week ago and I have heard nothing from Comet or Miele. I still have no washing machine machine, three weeks now! Next step is I am off to get the forms from the local Court. I will keep you posted. Hello Penny: Under the sale of goods act they are not obliged to replace an appliance if they can show it is disproportionately expensive compared to the cost of a repair – especially if it’s a minor fault. But having lost confidence in a machine that has exhibited such potentially dangerous behaviour though takes it into different territory and I would expect a retailer to be sympathetic to that. A lot depends on how long you’ve had the machine too. Unfortunately as Miele are the highest quality washing machine you can buy it creates quite a dilemma as to what to replace it with. Please keep us posted thanks. Dear Sir i own a Miele Komfort ModW1713. which was purchased Nov 07 up till now it has not been a problem. Last Thursday while washing three towels on a cotton programme 60 degree wash about half way through there was a loud bang and a noise like shaking ice cubes in a cocktail shaker. to my astonishment the inner dome on the door had exploded and filled the drum and washing with glass. Ran Miele the following day customer afterservice said they had never herd of this happening before and needed to get an engineer straight out to investigate, also wanted me to speak to one of there engineers so put me on hold. After a few minutes they came back said they didn’t need to speak to me and it would be over a week before the engineer would come out with the replacement parts and to investigate. They asked if i had knocked door or anything but that is all, luckily we were here but like your other commenter my wife now has no confidence in the machine,makes it worse that they stated it has not happened before when it obviously has. To update on the Miele W3740 glass door shattering and Comet and Miele’s disapointing response. Since sending a letter to Comet under the 1979 Sale of Goods Act (no response) I have written again stating my intention to take legal action against them, I asked for a written reply, they replied only by telephone. No one wants to commit themselves to paper anymore. Comet appear content to sit back and let Miele dictate the outcome although it is they who hold liability under the Sale of Goods Act. I had the same experience as Bill initially when I first informed Miele and it took another ten days for an engineer to just look, no repair. In the meantime I have been without a washing machine since 5 January. Miele have stated that they will undertake repairs under the guarantee. They will replace the door and remove glass from the drum using heavy lifting gear in my home, I have declined this offer, they then suggested they could do it in the garden! I declined this offer too, not wanting glass all over my patio and garden, I have a dog. Comet and Miele continue to fail to acknowledge the safety issue, they said that should the glass door shatter again it will be covered under their extended warranty, no mention of what happens should injury occur or if it happens after the warranty has expired, presumably the customer pays. Miele are not interested at all in why this has happened and that this machine has proved itself to be a time bomb, Miele are obviously aware of the other machines and glass breaking incidents and appear happy to keep their customers in the dark, to maintain the status quo probably all in the name of money.